06/10/14: Began this quilt last night using leftover hexagon scraps from the ‘Grandmother’s Flower Garden’ quilt top. This pattern is commonly known as ‘Inner City’ but since I’m literally using trash to make the English Paper Pieced units, I’m renaming it ‘Urban Renewal’. It does remind me of a city landscape coated with fresh, bright paints. 06/20/14 Got all the pieces cut for this quilt. I’ll probably have extras for either a baby or dog quilt. I like having those on hand for quick, impressive gifts. The units roughly laid out currently measure 45″ x 24″. It grows each day! 9/9/14 I work on this quilt top nearly every day and it’s slow going. This is how it looks now and measures 52″ x 60″. I’m considering adding another row or two, then straightening the edges with black pieces and adding a black border. It will be a nice size sofa quilt. 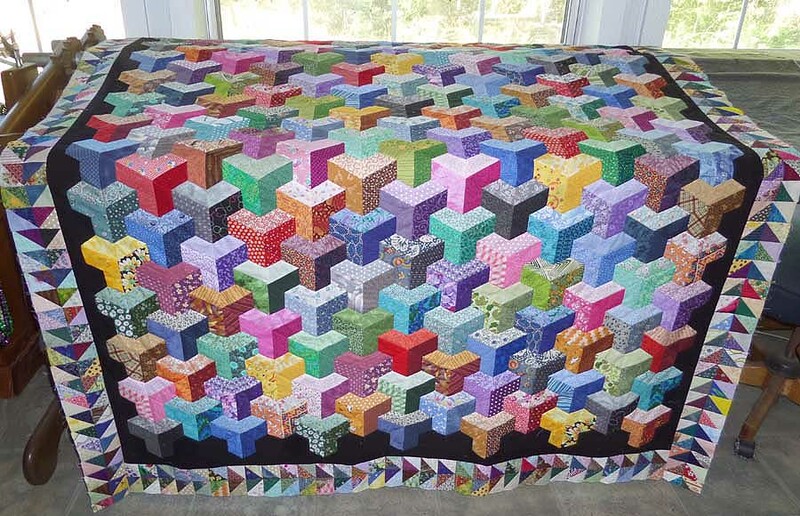 Because of the amount of work involved, this quilt may live at my house instead of being gifted. 10/05/14: Finished straightening the edges with black partial units and stitched on a black border. I still need to miter the corners of the border and decide what I want to do next to this top…. Do I add a pieced border?…. or another solid border?…. or leave it with a single black border? Then comes the decision of what backing, quilting design(s) and binding to use. Decisions, decisions, decisions. 10/22/14: After auditioning several borders, I’ve settled for Flying Geese. I like the extra size it adds to this top. The top now measures 62″ x 78″. It should be big enough for sofa snuggling. Hoping to sandwich and hand baste it soon. 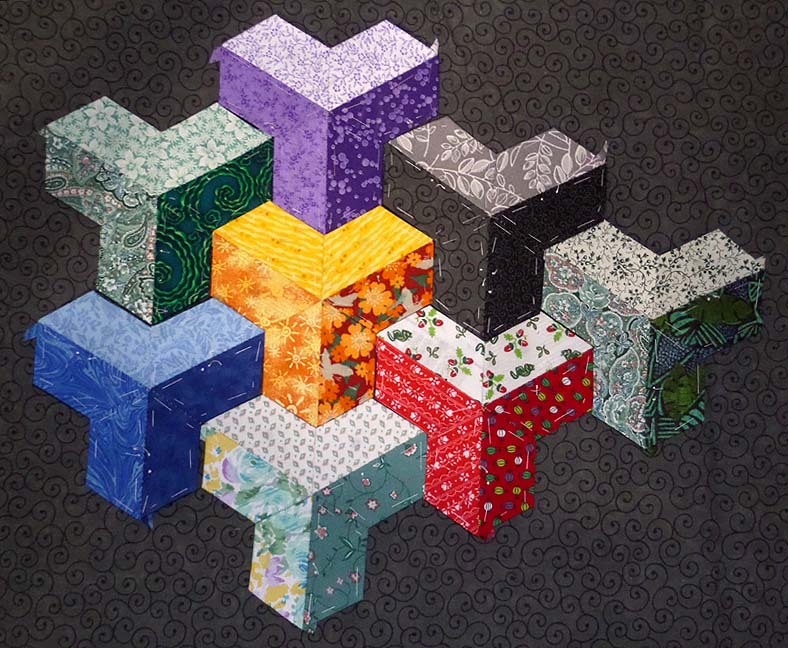 11/03/14: Hand basting is done and quilting has begun! For those interested in the details, I’m using Hobb’s Poly-Down batting and a light grey and black ‘stone’ 108″ wide backing (trimmed). The thread is black YLI Quilting 40/3 ply. The needles for this project are R.J. Roberts Betweens, size 7 and size 8 (depending on what I grab from the pincushion). I always use Crayola Washable Markers to draw my quilting guide lines. They’re readily available, cheap and wash out completely. My 36 years experience with these markers proves to me they are stable, leave no residue and wash out without returning. I won’t risk my handmade quilts to anything else. 12/17/14: At every step and turn, it was surprising how challenging the Urban Renewal quilt has been. This may explain why there are few to be found in the ‘wild’. I love that it’s unusual and proud it is complete. 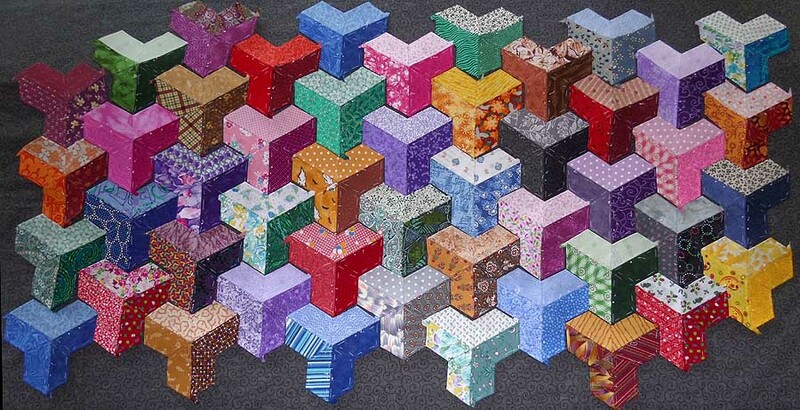 The body of the quilt was hand pieced, using the English Paper Piecing method. I straightened the uneven sides of the body with Kona black fabric before adding the flying geese border which was assembled on a vintage (1925) Singer 66 treadle sewing machine. The border was hand stitched to the quilt. The binding was made with black, deep red and blue with gold flecks fabric. All fabric, with exception of the backing, was from my stash. Even the thread and Hobbs Poly-down batting came from supplies already on hand. 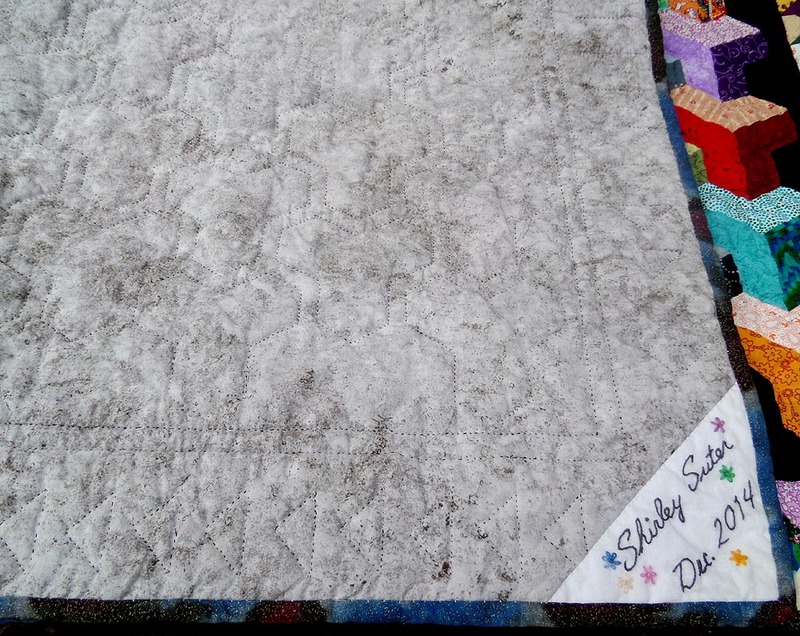 The backing is wide gray with black Marblehead fabric (manufactured by Fabri-Quilt) and the quilting was done with black YLI hand quilting thread. The label was hand embroidered. 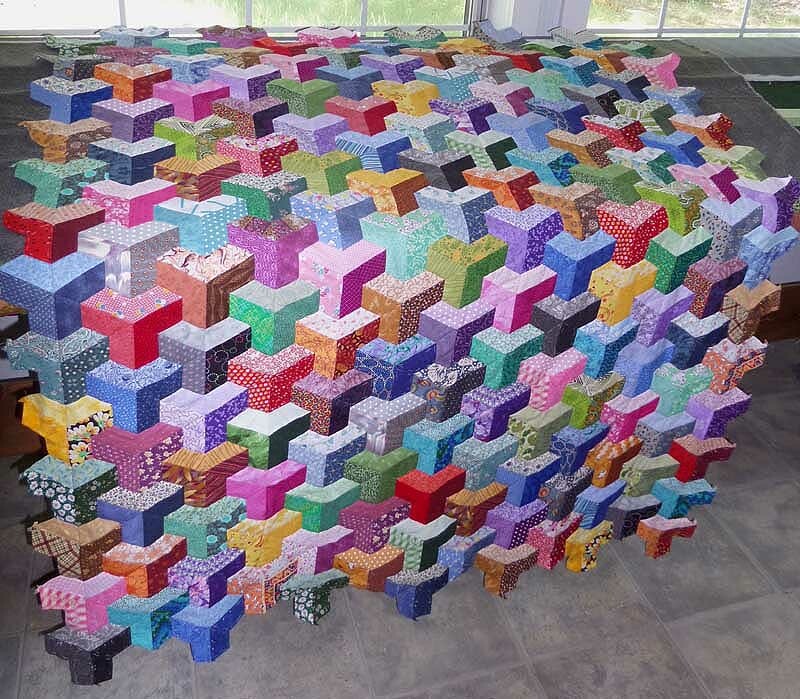 This sofa-sized quilt finished at 60″ x 75″; large enough to tuck under a chin and still have toes covered. 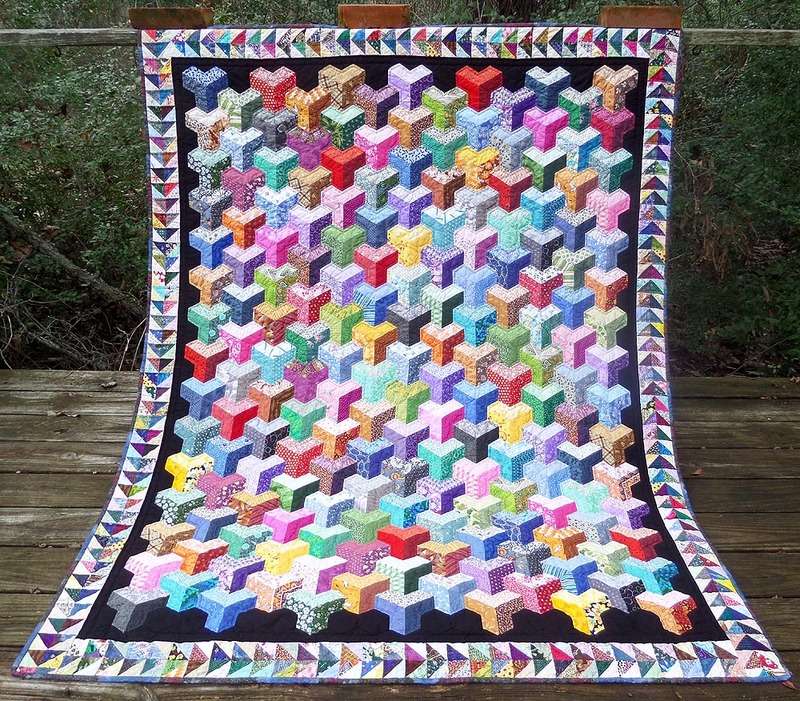 Although I’ve been asked by several people to gift this quilt to them, this baby is MINE! !